At a recent ministers’ fellowship meeting, one of my brother ministers came out with the rather profound statement: “I don’t consider myself to be ‘religious’!” I agreed that I felt the same, but this opening gambit needs further explanation. According to my dictionary, religious means spiritual, sacred, holy and implies aspects of devotion, piousness and, to some extent, a sense of duty. Religion, I think, in its truest sense, encapsulates all of these, though over centuries, it seems to have lost much of its original meaning, becoming corrupted by human misuse until it almost becomes something unsavoury and not to be countenanced – something less than normal – often a term of derision, or weakness, in fact. The main point I want to make in this blog is that actually religion should not be considered ‘something additional to the life we lead’, but is, in fact, completely integral, to that life. When my friend the minister said he did not consider himself to be religious, the interpretation that makes sense is that he really wanted to distance himself from “religiosity”, which for many people refers to that corruption of the word ‘religious’ over the course of centuries. Religion, in its true sense, is concerned with our way of dealing with human belief(s) in a divine power. Experience tells us that there are many different systems of beliefs – i.e. different religions – and also, many different concepts of divine power – i.e. belief in one god (monotheistic), or indeed, in a plurality of gods, (polytheistic), but the essential element of all religious beliefs is that there is some power above, and far beyond, all man’s capabilities – infinite, creative power, far beyond our wildest imaginings, and our (human) relationship with that power. 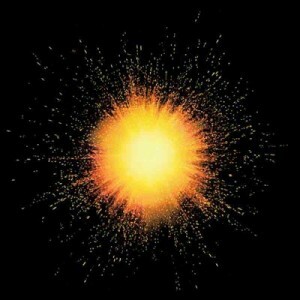 The Big Bang – Flaring forth of the primeval fire ball possibly 13.7 billion years ago. However, for the purposes of this blog, I think it is necessary to leave behind the general discussion and narrow things down to the particular. Christians believe in the power of one God – almighty and everlasting – all powerful and all loving. Unfortunately, not everyone can accept this idealism and there are many different, sometimes controversial, sometimes comical ideas of what God is, and this brings us, inevitably to consider the nature of God – and our relationship with Him. Unfortunately we often think of God as a vengeful and harsh ‘Puritanical Policeman’ who is out to ‘get’ us, or to disappoint us, or to manipulate us. 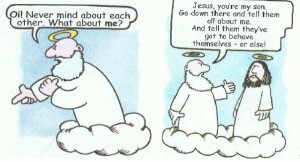 We fail to recognise his constant and everlasting loving attention – Love with no strings attached. Other caricatures of God include one who is not interested in us, or who has given us an interfering church that seeks to imprison us, in difficult rules and regulations. some kind of manipulator, and woe betide anyone who steps ‘out of line’. All joking aside, I cannot do better than to fall back on some of the most basic of precepts. Last week, the readings at Mass described the Creation i) of the earth, land, sea, sky, birds, fish and beasts, and (ii) of man and woman, in God’s own image and likeness. From here, I think, we must go deeper, to register our beliefs that God made us to ‘love him and serve him, in this life, and to be happy with him for ever in the next’. In creating human beings, it is important to note that there was no compulsion; God did not have to make us; God could easily have managed without us – all of us; God made us out of love and for no other reason, and the very important point to note here is that the ‘love process’ is ‘two-way’. God loves us – enough to create us – and he wishes nothing more than that we should love him in return. We do that by serving him – by doing his will – and this brings me back to the discussion that forms the opening subject of this blog. The two-way process of love is what religion (and religious), is all about, and strange as it may seem, forms part of a wonderful insight very much connected with that prayer of divine genius, the ‘Our Father’. The phrase “Thy will be done on earth as it is in heaven” is fundamental and central to the conversation. God’s will is absolutely basic, sublime, fascinating and as beautiful as the face of ‘Love’ itself – for God is Love, and God’s will, for us, is the face of utter beauty, mercy, peace and fulfilment; it is God, Himself. Now, is that ‘religious’, or is it simply a matter of being human? The will of God converses with us each day, each moment, throwing out invitations for us to respond. God gives us a ‘golden divine thread’ to knit a pattern that belongs to this life, then goes on for ever and ever, in the next. God wants us to accomplish marvels, even in the small and seemingly uneventful life we lead. Wouldn’t anyone who is Love want this? And, in absolute confirmation of all this, we have the exclamation of the one who, some 2,000 years ago, was the most fully ‘complete’ and ‘human’ being on earth, and is now Queen of Heaven. At the Annunciation, the angel told her she would become the Mother of God’s Living Word – the Mother of Jesus – and Mary, once she had absorbed the stunning news, that she would be the Mother of the Messiah, the Mother of God, said, “Be it done to me, according to your word”. Mary lived an unobtrusive, quiet and obscure life, unknown to the great leaders of her time, fully in God’s will. Yet we know that she is acclaimed in the book of Revelation as somehow ‘over’ and ‘above’ the cosmic creation. with the moon under her feet, and on her head a crown of twelve stars” Rev 12: 1. From that moment onwards, that was the ‘leitmotif’ – the recurring theme – of her whole life. It was because she lived God’s will, so perfectly, that she became the Mother of God. 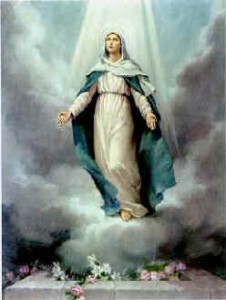 In the book of Revelation we have the description above, of the greatness of Mary in the plan of things. She is ‘Queen of all Creation’. One of the main arguments for the existence of God (St. Thomas Aquinas, 1225 – 1274) comes from the design and order of things – there being a purpose, a directive principle, in all the works and processes of nature. Thus, everything in nature, every living thing, has a dependence and inter-dependence on everything else – and all in accordance with the plan of a supreme power. The conclusion, here, is that the whole design is so large, and of such complexity, that it could not have happened by chance – the chance being an immeasurably large number, (so large as to approach infinity), to one against this being true – and we are part of that design. We may say we were born in 1984, 1979, 1962 or whenever. Actually God has had us in his mind from before time began – always, we were part of His plan; he had always thought of us; he always loved us; we always were close to his heart. And it is, precisely, the living of God’s will that makes each person become fulfilled, in his or her vocation. In other words what happened for Mary, in much smaller proportion, happens for us. 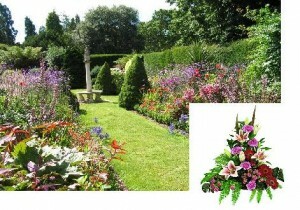 Take a small green leaf in an arrangement of flowers. If that small leaf was not there, the arrangement would be out of harmony. If the smallest little plant in the garden were absent, then something would be missing in that garden. God has created me to do him some definite service; he has committed some work to me which he has not committed to another. I have my mission – I may never know it in this life, but I shall be told it in the next. I am a link in a chain, a bond of connection between persons. He has not created me for naught. I shall do good, I shall do his work; I shall be a preacher of truth in my own place while not intending it, if I do but keep his commandments and serve him in my calling. Therefore, my God, I will put myself without reserve into your hands. What have I in heaven, and apart from you what do I want upon earth? My flesh and my heart fail, but God is the God of my heart, and my portion for ever. So, to be angry at God’s Will, especially in moments of difficulty and suffering, to be antagonistic, or to feel that life is just a series of monotonous moments, filling in the time we are alive, is simply an unintelligent way to think and act. The intelligent way would be, always, to accept God’s will with love, full in the knowledge that this – our acceptance – is pleasing to God, but in order to ‘yield’ fully in this way, we would first need God’s grace – his gift – which would allow us to be open and honest in recognising our NEED for God. Once having come to that ‘standard’, it would be most helpful to train our minds and hearts – as Cardinal Newman states – in putting (ourselves) without reserve into (His) hands; in our ‘training’ the help and support of other like-minded people would be a blessing, for then we would have the advantage of learning from others, wise in these ways. From a purely ‘earthly’ or ‘human’ point of view, and without reference to God, it would be just too difficult to be wisely intelligent and ‘rejoice’ in all that ‘providence’ might send us, but once we recognise our NEED for God, then we have our life on the ‘right track’, and this is what the saints, mentioned in last week’s blog, achieved. This argument leads, inexorably, to the implication that to be fully human, using our intelligence to the full, a person needs to be closely attached to God – to be on the ‘Royal Road to Sanctity’ in other words. Without an awareness of the Divine, one of the greatest gifts a person has – intelligence – cannot be exercised to the full! I think it a truism to make the point, that those who are saints – those who are fulfilled, human beings – will be people who practice their religion. They will value the sacraments, frequently receive Jesus in Holy Communion at Mass, and join in activities that are externally religious, for example, spending time in prayer, helping others, being loving people. But, over and beyond all that, there is an awareness of something else, something purely of their nature, and of the nature of the cosmos in which we live. Put simply, we are all creatures made in the image and likeness of God; it is inherent, therefore, in our nature to be calling out for joyful and positive reference to him – in fulfilling his loving plan for us – as we respond to his will, in our lives. What is Religion then? It is, essentially, very much akin to our experience of life, when we act according to our nature – a nature that is created in the image and likeness of God – and seek out that supreme, divine power that created us. www.stmarysblog.co.uk should they wish to read it in its intended format).